I've been spending a lot of time thinking about my spring/summer sewing. How to make ideas work in my Chico's Chic theme. How to make it casual enough for my work environment but still me? I have a plan and a list but it just seems like it needs to be refined a little more. I was going to post this picture to Instagram and then realized that I had a lot more to say than I wanted to type under an Instagram photo. I bought these patterns 14 years ago. I remember where I was living and what stage of my life I was in when they were purchased. I also worked at a job with a much more casual work environment and these were the types of garments I was sewing to wear to work. I found these patterns rambling through my pattern drawers. See along with not buying a lot of fabric this year and using what's in the fabric collection, I also want to use what's in my pattern collection. If I was to describe my style I would say it's classic with a dash of funky. That's why 14 years later I can still use all of these patterns. If you've been sewing for awhile you will remember these Adri designer patterns. If you haven't, I'm sorry you missed out on these because they are wonderful patterns that are chock full of different garments conveniently available in one envelope. Yes, I've been collecting patterns for a long time. An aside, as I was rambling through my Vogue Designer Patterns, I found Calvin Klein patterns ~ does anyone else remember when the Calvin Klein Jeans pattern was carried by Vogue Patterns? Other designers like Givenchy, Tamotsu, Geoffrey Beene, Anne Klein, Oscar de la Renta and Ungaro to name a few. Let's not talk about the drawers full of plus size 60s patterns with Jackie Kennedy like looks and the mod look. I digress. I will be adding some of these looks to my Chicos Chic collection with the original fabric I purchased to make them with...yes, hanging head in shame, some of those fabrics are still in the collection. Okay, not hanging head in shame...there are some pretty wonderful moments associated with those fabric purchases! Anyway all of this rambling is to ask, Do you still have loads of patterns, designer or otherwise in your fabric collection from 10, 15, 20 years ago? And were they originally purchased then? Do you still purchase loads of the newer released patterns too? Do you think you will ever sew them or are they just for inspiration? Honestly, my love of the TNT pattern and my need to make something 3, 4, 5 times before I put the pattern away, definitely means that I won't be sewing all of the patterns in my collection. But after fabric, patterns are the things that fuel my creativity. All of this to say that I've been digging in the pattern stash to add items/garments to my spring/summer sewing list. BTW, I did do some sewing this weekend. A reversible vest and a midi skirt are done. I just need to get some modeled shots and hopefully this weekend will be okay weather wise to do so. They will be part of two different outfits for the wardrobe theme. Well you can always "borrow" some of mine! My grandmother, who is 96, used Vogue patterns exclusively for decades. She was a perfect size 12. Unfortunately, she got rid of all her old patterns when she moved 4 years ago; how I would love to have had them (but that was before I rediscovered sewing). 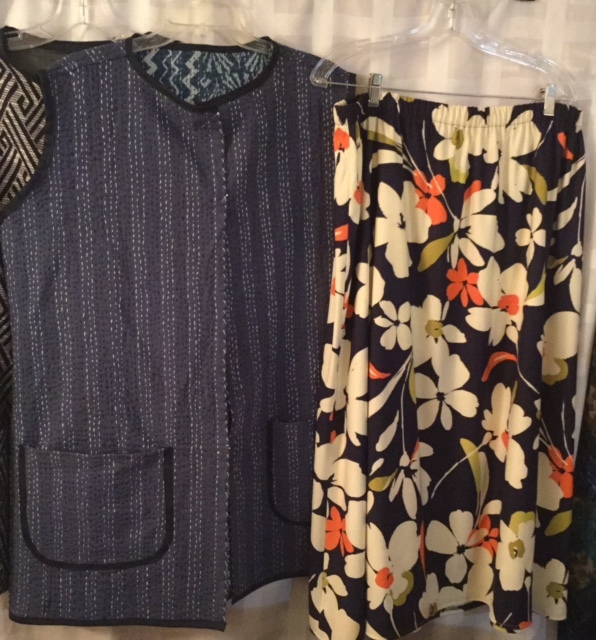 I haven't been at it long enough to have a collection of old patterns, though I did cart around a wrap skirt & blouse pattern for about 20 years without ever making it again after the initial make (wish I still had it). I am reassured by what you say about fabric and patterns being inspiration for you, as I find it's the same for me. I currently have more patterns than I could sew in a year, and a few I'll never go to the trouble to redraft (old vintage patterns several sizes too small), but I love them all. I have been buying patterns for fifty years, and am So Sorry about the number I have thrown/given away, especially when moving house. The old patterns had much better instructions, good techniques and details - I was doing bound buttonholes in my early teens, and making very nice lined jackets. Nice to see your floral skirt, material which I love. Planning to make a skirt today, I was thinking I need to find one of your skirt making blogs, because I know you do them so well! Yes, I do have patterns that old. But no Adi. A lot of Anne Klein. I don't buy many patterns today as I have so many I haven't made and they are more or less the same over the years. Also TNT's are best as you don't have togo through the fit issue over and over again. Mind you I have bought some Stylearc ones recently..oops. Oh I should add no I don't buy many newer patterns but I never did. They are expensive here so tend to reuse what I have over and over. However there were a couple of good patterns sales here earlier so I bought two vogues for $5 each and a few Simplicity , New Look and Butterick for $3 each - though these prices do not happen often. I have 2 of those Adri patterns (and a lot more of her's as well), I loved her patterns then and still do. I only wish she was still around, she designed beautiful classic clothes. Now I feel the urge to find my Adri's and make something. Thanks for the inspiration. I have the 2nd Adri from the top and was checking out the fabric requirements for the sleeveless top just this week! I totally agree with you about keeping the patterns of the past - the great ones never go out of style. Sadly, I have only in my 40's begun to really appreciate Vogue patterns, when I was younger I thought them too expensive so never purchased them, a decision I regret now. I'm of the opinion that if you love something about a pattern, you might as well buy it. Even if it just helps clarify your "look", it serves a purpose, whether it ever gets cut or not. Karl Lagerfeld apparently buys books as inspiration, other people collect art or embroidered textiles or metal sculpture or beads-if we have a positive reaction to something and we have the means to acquire it so that we can indulge our senses with it, it cannot but help our creative process. I highly recommend Pinterest to a lot of people, it's a way of acquiring a collection of design ideas for oneself-certain patterns and trends start to emerge, and a personal style can be built upon that, and Pinterest costs nothing to use. Kind of wandering here but I think you get me! LOL! Not only do I remember Calvin Klein jeans pattern, I still have it. And I think I actually made a pair back in the 80's when I took a jean course. Some of my very first sewing was Tamotsu dresses, I recall a red linen one that was just perfect. Wow! That pattern was like gold and for many years my sewing friends hunted for copies of it! Ooh lovethat vest and I loved the Adri patterns and have a couple and still use one on a fairly regular basis. I have a lot of fabric and have been particularly bad this spring because I love navy blue and my Fabricville is oozing with gorgeous navy fabric of all sorts and Patterns are a real weakness too. Being a BMV member doesn't help !!! I have patterns from 1994 onwards. When I moved to this house with my new husband I thought I had to leave my old life behind and threw out ( Can you imagine ?? ) all my patterns from 1966 to then. I've been kicking myself in the a-- ever since! I have one pattern that my mom made in the past; my wedding dress. I do remember that she bought Simplicity patterns (as did I when sewing at school) as they were probably the only ones we could buy at that time. Vogue, McCalls, and Butterick came to our neck of the woods when I was an adult. I really missed out on some nice patterns because of that. Your collection of Adri patterns are great and will fit into your wardrobe plan perfectly. Some of the Adri patterns are wonderful, aren't they. To my eye, there is sometimes a problem with minimalist styles such as Adri and Loes Hinse: they can look skimpy. I don't know just what contributes to that look -- thin fabrics? Edge treatments? The thin models on which they are displayed? I suspect luxurious fabrics, exquisite workmanship, looser fit are all crucial in achieving a non-skimpy look. Carol - I will definitely be using beefier fabrics and not necessarily following the pattern choices on the envelope! I also think that the solid colored fabric renderings don't do the line drawings justice! I have a bunch of Adri patterns, too. I'll post them on IG when I get home. Funny that we should both write about pattern collections on the same day. Oh my, I have so many patterns too. Many are from the late seventies, eighties and nineties. It's nice to sit and ramble through them. The experience brings back memories of all things. I'm interested to see what you decide for your spring collection. Hah! I still have my uncut Calvin Klein Vogue jeans pattern! It's going to be sewn right after a pair of CCF Gingers. I am also chasing patterns that were in my mother's & grandmother's pattern collections. Partly for the nostalgia & partly because they were classic designs that I can easily wear now. For some reason, I have very few of the patterns I sewed in the past - and I do not remember getting rid of them but I must have! I did keep a few favorites and still use them. And, of course, I can always find new ones to buy! I also pick them up at yard sales and sell them on eBay if I can't use them. I feel like I need to find someone who will appreciate them! I am that way with quilts, too. Hate to see someone's hard work disappear. I am older than you and I certainly do remember everyone you mentioned. I still have some of them too. I also made Issy Miyake when he was still designing. I made a fabulous Geoffrey Beene jacket and an Ungaro dress in a gorgeous wool challis that I made for the Jewish High Holidays. I rocked that dress! I also made a fabulous Bill Blass dress in black and white linen. Those were the days. There were so many designers to choose from. I also had places to wear those great designers. I loved and still love Tamotsu, and I have 5 of the Adri patterns in your photo, would that I was the size 14 that they all are!